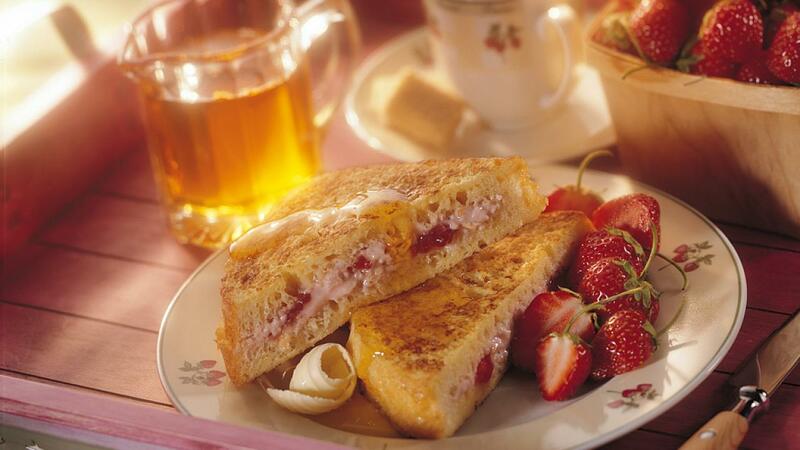 This strawberry French toast is great for a kids’ sleepover or when hosting guests from out of town. Make the day before for an easy breakfast or brunch the following morning that will get their day started right. Cut bread into 12 slices approximately 1 inch (2.5 cm) in thickness. Make a pocket in each slice by cutting slices in half horizontally leaving about 1 inch (2.5 cm) uncut. Combine cream cheese and jam. Spread about 2 tbsp (30 mL) cream cheese mixture into each bread pocket. Place in two 13 x 9-inch (33 x 23 cm) baking pans. Whisk eggs, milk, almond extract and vanilla extract in large bowl. Pour equal amount of egg mixture into each pan. Turn slices over. Cover and refrigerate for 8 hours or overnight. Spray 15 x 10-inch (38 x 25 cm) baking sheet with cooking spray. Place bread slices on baking sheet. Bake in preheated 375°F (190°C) oven for 15 minutes; turn over and bake until brown, about 10 minutes longer. Sift icing sugar over French toast, if desired, and serve with maple syrup. When making French toast, use bread that is at least one day old. If bread is too fresh, it will absorb too much of the liquid, become soggy and lose its shape.